Kandinsky’s famous concentric circles’ painting is a fabulous source of inspiration for kids and is often used by art teachers to explore colour mixing concepts. 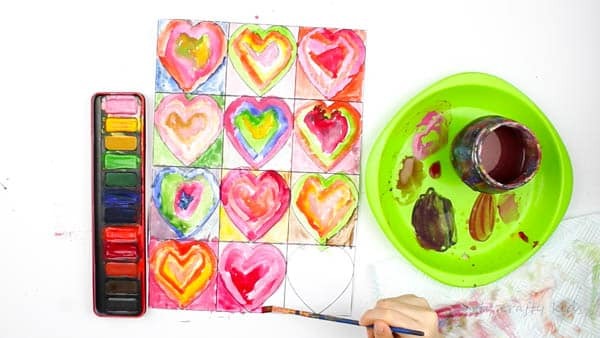 Our Kandinsky Inspired Heart Art is all about exploring colour-mixing, playing with light and shade, and the heart feature introduces a seasonal Valentine’s Day twist. The completed piece looks amazing framed and will brighten up any wall. 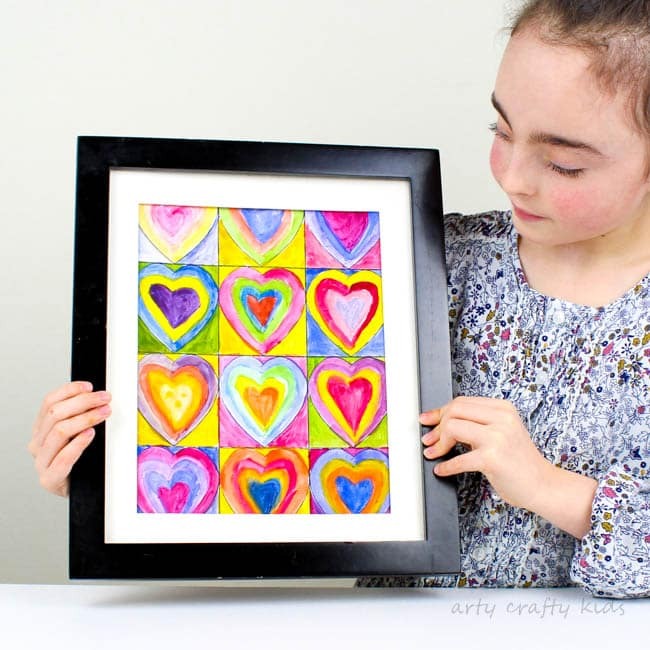 And if you’re looking for a kid-made gift project, then the Kandinsky Inspired Heart Art can be made for any special occasion – Birthday’s, Valentine’s day, Mother’s Day Christmas or even for ‘just because’ days. 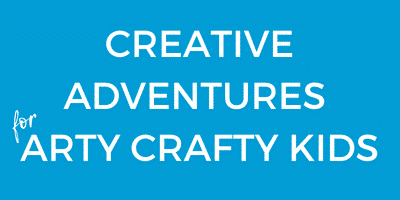 So let’s gather some materials and get arty…. 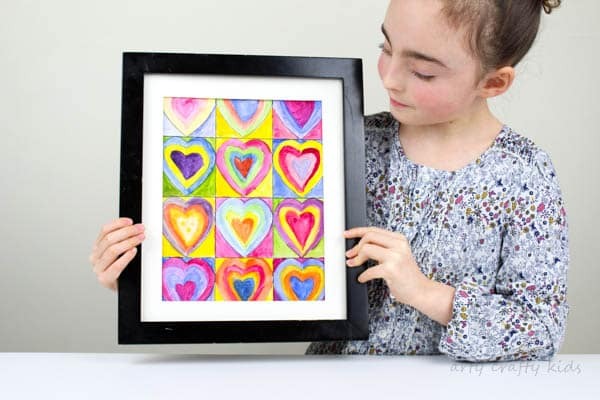 Step 1: Download and print the free Heart Art Template – remember to select ‘fit to page’ when printing. Step 2: Apply the watercolour paints. 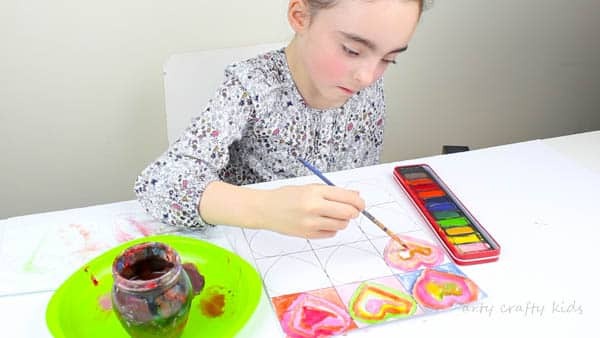 If your Arty Crafty Kids are using watercolours, there are a couple of ways to apply the paints. 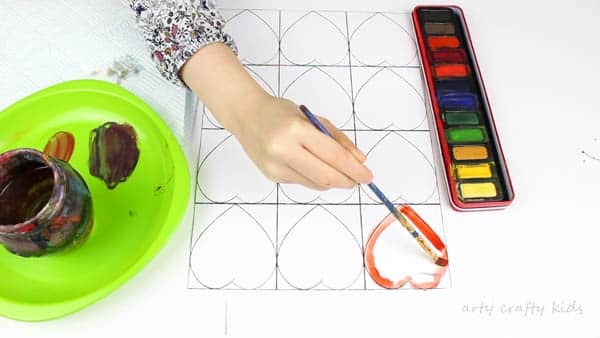 They can experiment with the wet-on-wet application, whereby a small layer of water is spread across the paper first with the paints mixed on top. Alternatively, or as well as, they can mix water directly with the paints. The amount of water used will alter the vibrancy of the colour i.e. 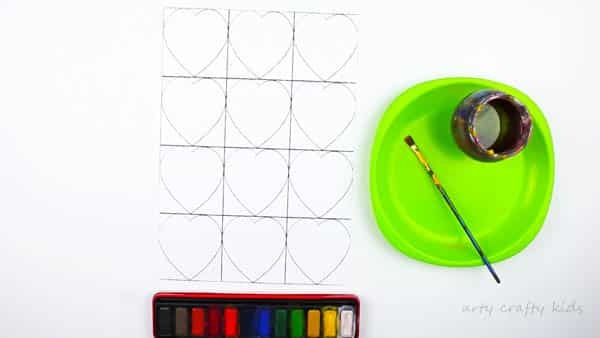 less water will create bolder colours; more water will produce lighter shades and are more likely to blend with the surrounding colours on paper. 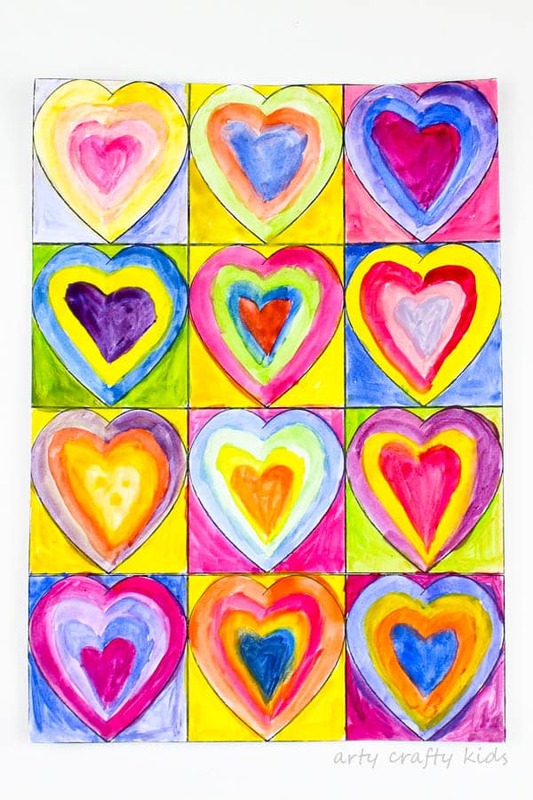 Step 3: Fill the hearts with contrasting colours or/and lighter/darker shades of one. 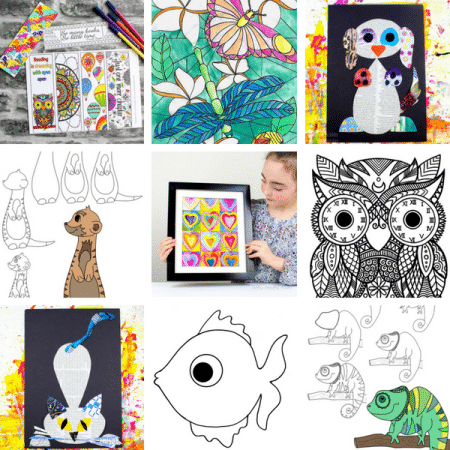 Fill the empty square space with colour. This could be one block colour or something else. Step 4: Continue filling the entire space with colour and contrast. 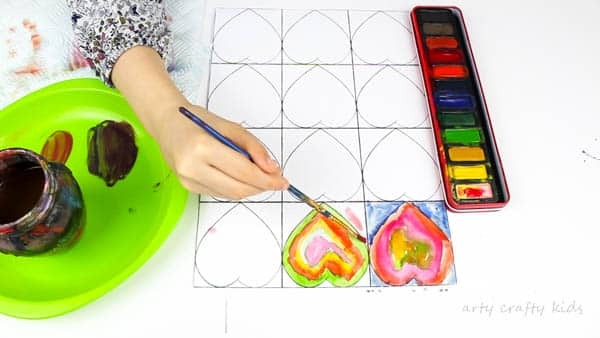 Step 5: While we have used the medium of watercolour paints, crayons, acrylic or even oil pastels could also be used. Step 6: Once the painting has dried, pop it into a frame! 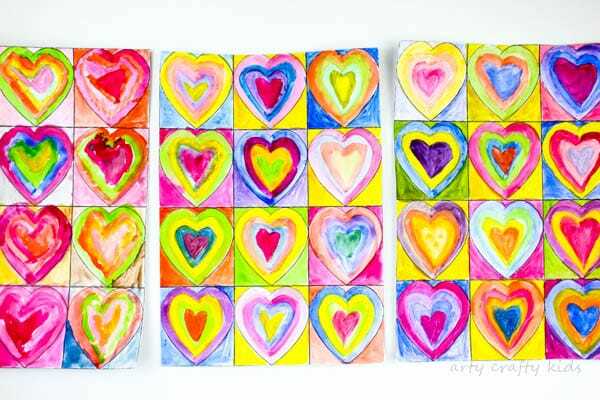 I hope your Arty Crafty Kids enjoy the process of creating their own spectacular Kandinsky Inspired Heart Art paintings.